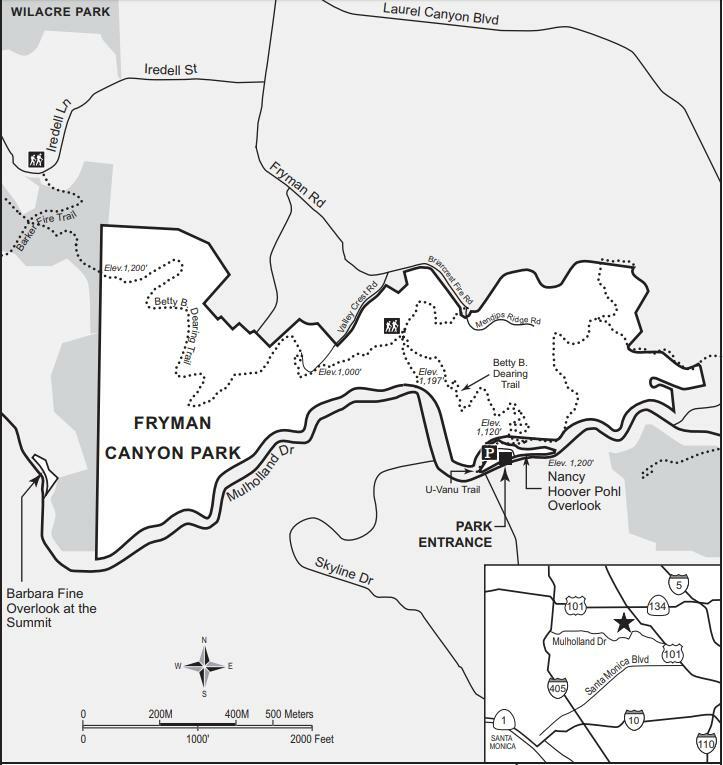 Accessed from the Nancy Hoover Pohl Overlook on the north side of Mulholland Drive in the eastern Santa Monica Mountains, 122-acre Fryman Canyon Park offers spectacular views, a fitness course, and access to the Betty B. Dearing Cross Mountain Trail. The Dearing Trail traverses the park and connects to Wilacre Park, Franklin Canyon, and Coldwater Canyon Park. The park is abundant with native chaparral, year round springs, and deeply wooded canyons. The trail is open to hikers, equestrians, and dogs on leash and under owner’s control. No mountain bikes are allowed on the Dearing Trail. A large paved parking lot is available at the trailhead.